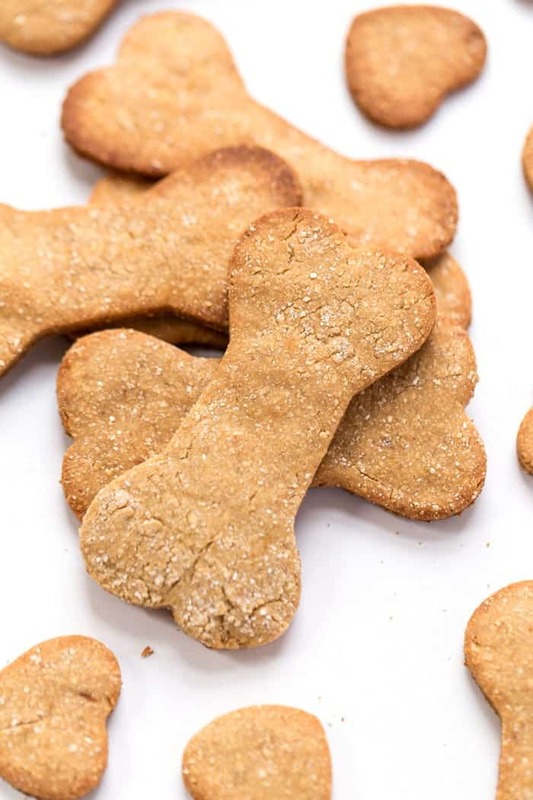 These homemade Grain-Free Peanut Butter Dog Treats are quick, easy and make a great holiday gift. They're high protein, use just 6 ingredients and dog-approved! I've always known I was going to be the type of mom who made baby food from scratch. I mean how could I not? I love cooking and I want my child to eat a diet rich in whole foods. But homemade dog treats? That I did not expect! Funny thing is, making dog treats from scratch is actually super simple and really cost effective. It's essentially like making cookies, but for your little doggie! Today I'm going to show you how to make some grain-free peanut butter dog treats that are high in protein, healthy and use just 6 ingredients! I've looked at making dog treats before, but haven't found a recipe that I love. 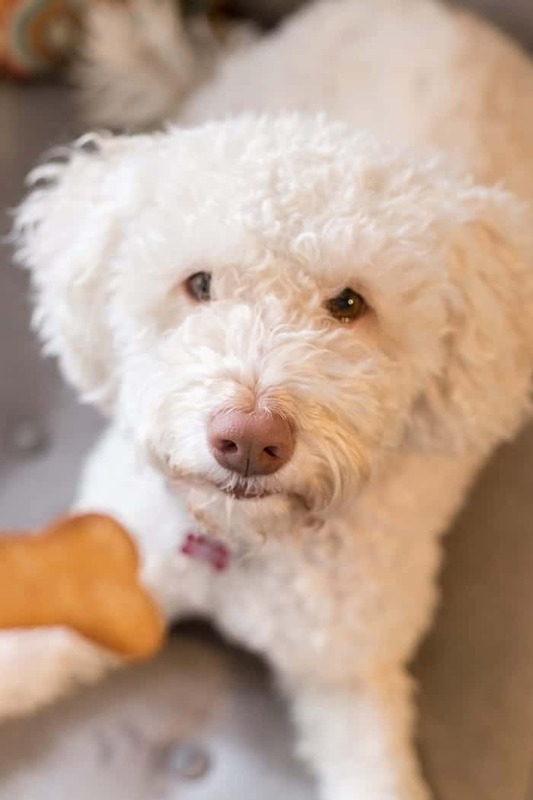 Trevi is on a grain-free diet, and has been her entire life, so I wanted to avoid all purpose flour and oat flour (which tend to be the primary ingredients in most dog treats). 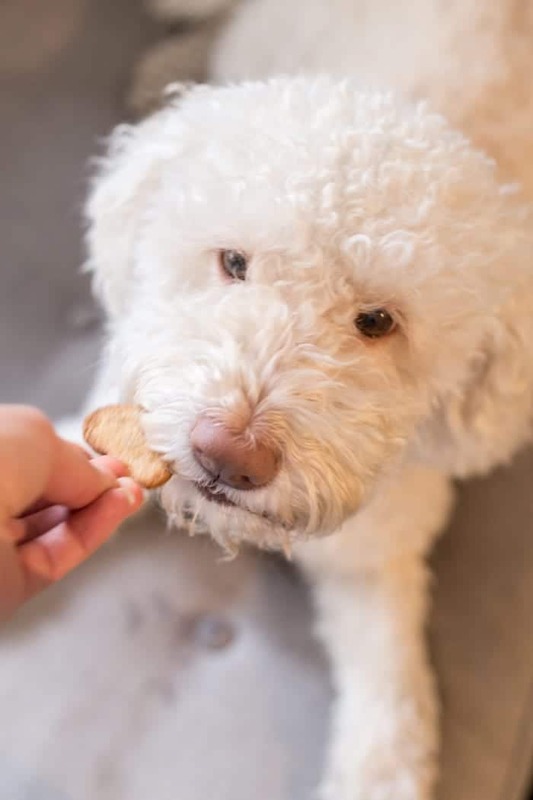 When I started searching for grain-free dog treats however, I noticed that many of them were filled with a nut flour or coconut flour. To me, a coconut flour and peanut butter based treats seem like a little bit too much fat for a pup. Chickpea flour has a lovely consistency when it's baked, it's naturally high in protein, is packed with fiber and you really can't taste it in the treats at all. It also helps hold them together and the higher protein helps make sure they don't crumble apart when you roll them out. I also added in some coconut flour. Coconut, in moderation of course, is actually great for dog's coats. I love Trevi's curls and coconut flour will help make them shiny and soft. And to finish these grain-free treats off, we have banana, peanut butter and eggs. Then cut them into shapes (I used this dog bone cookie cutter), bake and you're done! I was actually pleasantly surprised how easy these were to make. I've tried my hand at dog treats before and they've been a pain to roll out, super sticky, took a while to bake AND I used to use a tiny little cutter which took forever. This recipe? Comes together in under 20 minutes! 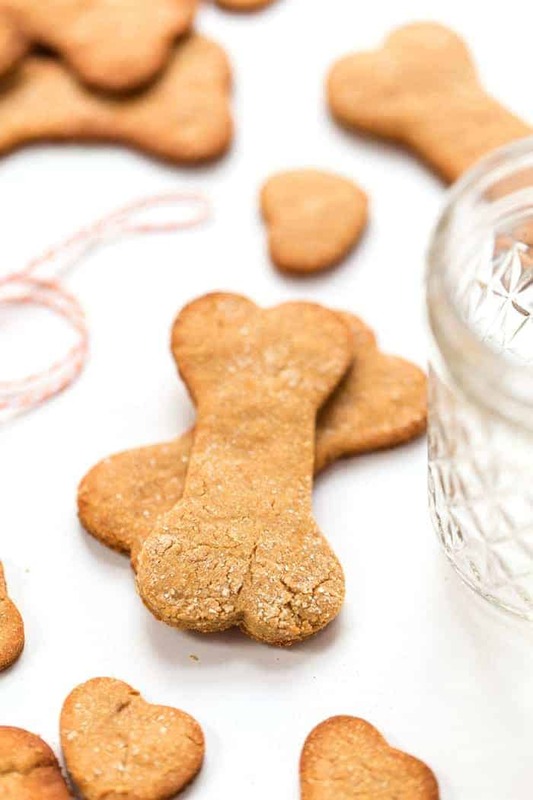 These grain-free peanut butter dog treats also make the BEST Christmas present! 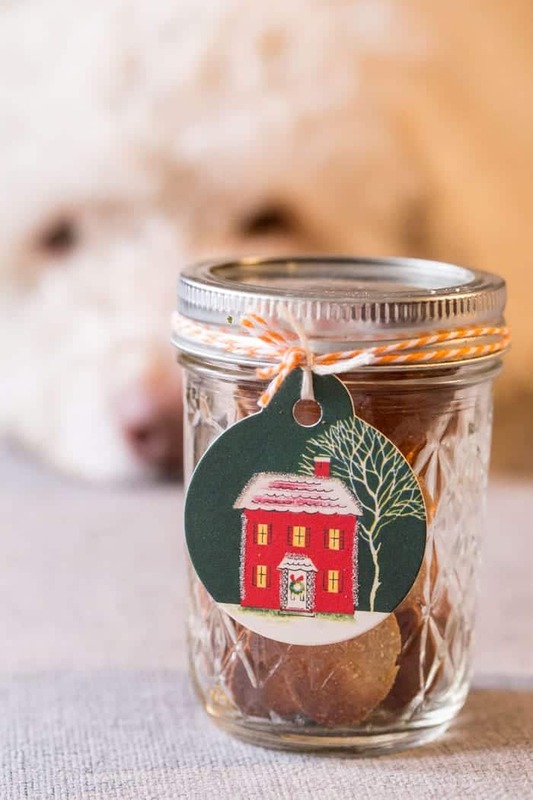 If you're already going to be baking up some cookies, whip up a batch of these and give them to all your little furry friends. And since they're (mostly) allergy-friendly, you don't have to worry too about them causing upset tummies or…ya know, the other thing. 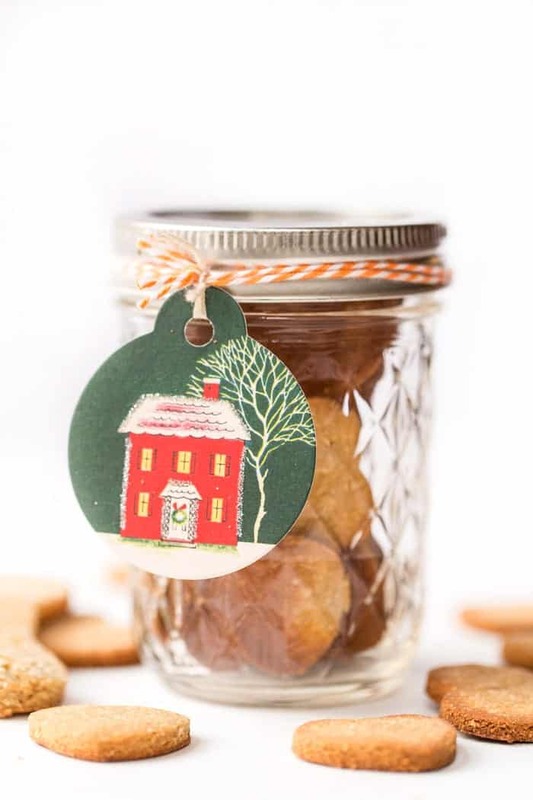 I like putting mine in a mason jar, adding a little Christmas tag with a little handwritten note (usually from Trevi!). 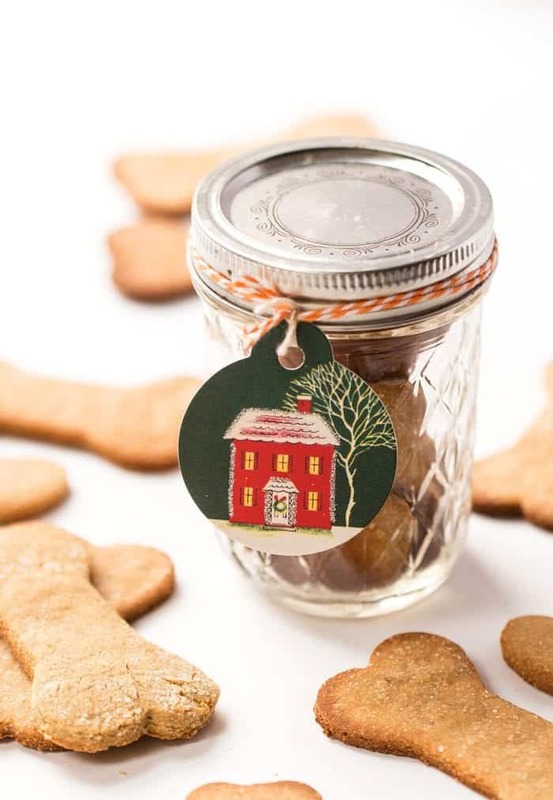 So sweet, personal and please…tell me what dog owner wouldn't want to get homemade dog treats!? Merry Christmas friends and happy holiday baking! In a large bowl, mash the banana as smooth as possible. Beat in eggs until fully incorporated, then beat in peanut butter. 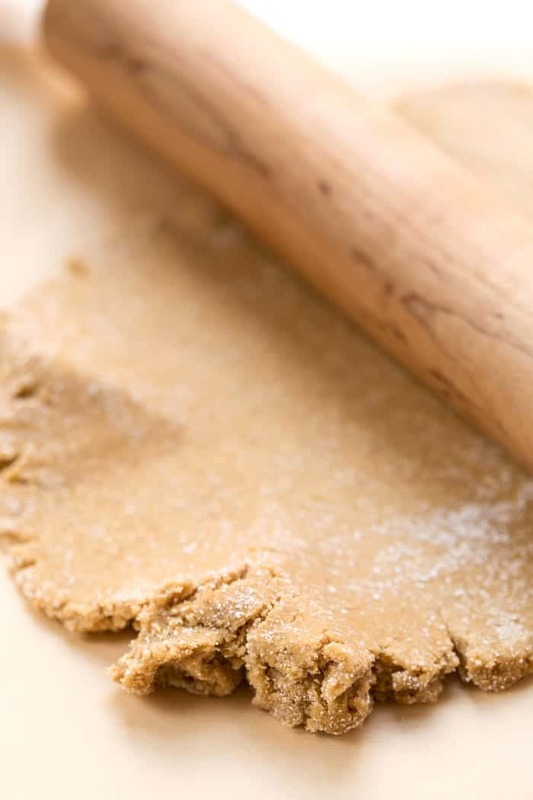 Once smooth, add the chickpea flour, coconut flour and baking soda, and start to fold together with a spatula. It will likely be tough to get everything incorporated with just a spatula, so switch to using your hands to finish kneading the dough. Once all the flour has been folded into the dough, transfer it to a flat, parchment lined surface and roll it out to 1/4" thick. You might have to sprinkle with a little flour if the rolling pin starts to stick. 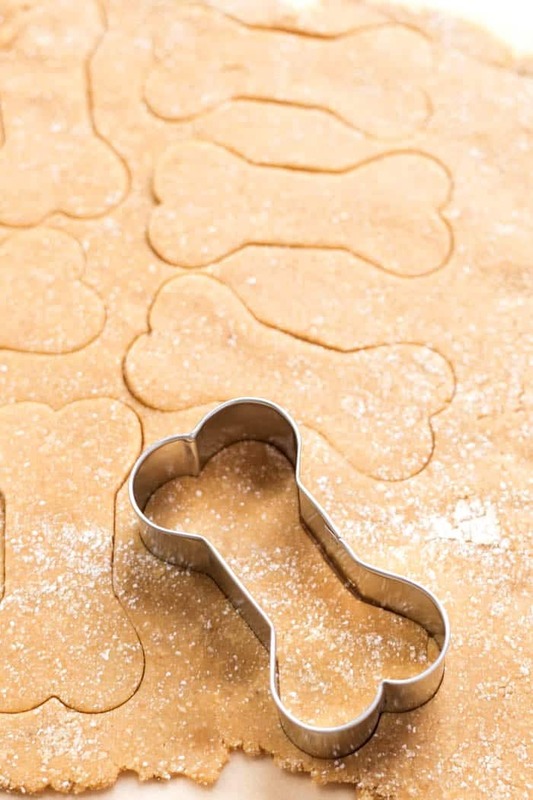 Cut the dough into whatever shapes you want (I used this dog bone cookie cutter) and place on a baking sheet. Bake for 14 minutes until the treats are golden brown. Remove from oven and let cool completely before serving to your doggie (or packing up as a gift). Keep for at least 7 days in a sealed container! Yep! And the 7 days is out of the refrigerator! I followed the recipe to a T. They came out PERFECTLY! Thank you so much I was looking for this and it is perfect for my dog who has food allergies. Hi ya my girl dog burns the lawn pet shop said go grain free biscuits do you this this would be ok for her. I think she’d love them! May I substitute flax egg for the eggs in this recipe? I haven’t tested them that way, but it’s worth a try! They’ll last at least 7 days! 🙂 But no you can enjoy them right away! Is there any other kind of flour that would work in place of chickpea flour? I think pretty much any other grain-based flour would work!